For centuries, Venice was the most influential power in the Mediterranean, and today it is a powerhouse of tourism. Yet Venice has preserved its magic, and many visitors feel changed by their encounter with this Renaissance city of bridges and canals. But legends don't come cheap, and Venice is an expensive destination, dining included. Oro Restaurant in Hotel Cipriani Venice is worth the splurge. It's a peak dining experience that delivers fantastic food, magical atmosphere and views, and superlative service. This is an exquisite restaurant for an epic hotel. Oro won a coveted Michelin star in 2016 and 2017; see Michelin's comments about Oro. Many Oro diners (and Hotel Cipriani guests) are very wealthy individuals. For them, Oro's stratospheric tabs are just the price of dinner. For other diners, this is the price of a serious splurge. But no one comes to Venice to save money. They come for the memories. And Oro is bound to be unforgettable -- and in more ways than the size of the check. 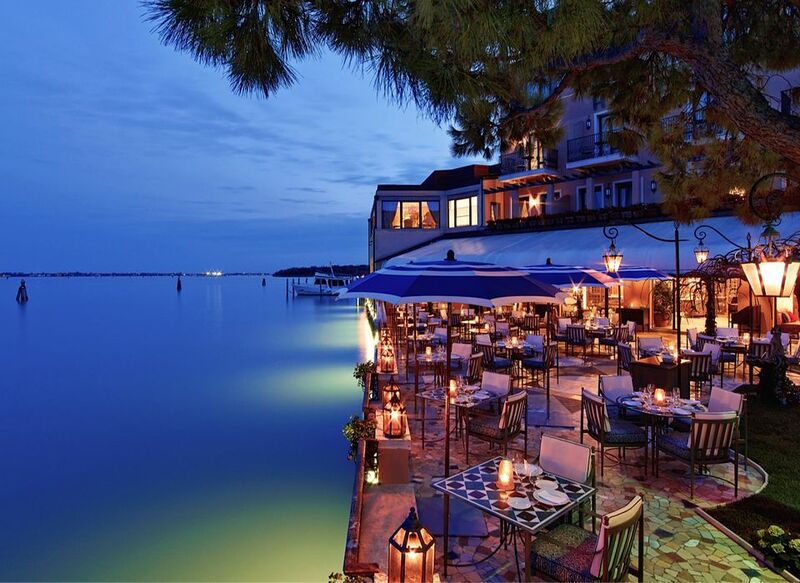 Oro is the signature restaurant of Belmond Hotel Cipriani Venice, a legendary hotel. This is a bucket-list kind of place that draws elite visitors who wouldn't consider staying anywhere else in Venice. Quite a few Cipriani Venice guests are upper-crust Americans who grew up vacationing here with their parents and are now carrying on this luxurious tradition with their own kids. The hotel, which resembles a pink palace, is more of a resort than a city hotel. It resembles a pink palace -- one whose royal residents like to swim. The hotel's 100-foot pool is not only huge; it's the only hotel pool in Venice. Venice's other top hotels are set near Piazza San Marco, considered the center of town. But Belmond Hotel Cipriani Venice has a unique location away from the crowds. The hotel nestles on an island, Giudecca, a few minutes across the Venice Lagoon from Piazza San Marco. The hotel provides an elegant (and complimentary) boat launch to and from Piazza San Marco for its guests and for visitors to its restaurants. Many Oro diners commence their evening at the hotel bar with a Bellini, the famed peach-flavored bubbly cocktail that was invented here. How wonderful to post: "Having Bellinis at Hotel Cipriani Venice"
And now it's time for an unforgettable dinner. In warm weather, Oro diners gravitate toward the elegant patio. It is softly lit, with an enchanting view of the timeless Venice waterfront. It's like dining in a fairytale. The indoor dining room was superbly designed by top-tier restaurant architect Adam Tihany. The look is modern, with a circle motif of spherical lights and undulating banquettes. The palette is subdued gray, like the pigeons of Piazza San Marco. Accents of burnished gold (oro) please the eye. This is a dining room that murmurs, not shouts. Oro's kitchen wizard, Davide Bisetto, is a celebrated chef in Italy. He was tempted away from his own two-Michelin-star restaurant in Corsica to come back to Venice and his native Veneto region and establish Oro Restaurant at Belmond Hotel Cipriani Venice. Corsica's loss is Venice's gain. To this gifted Italian chef, cooking and art are inseparable. His dishes are a delight to the eye and to the palate.Yet as beautiful and delicate-looking as his creations are, they lose nothing for the sake of art. They burst with flavor. You can download Oro's menu, which offers both a la carte dishes and multi-course dinners. Oro's kitchen serves the bounty of Italy: pasta, pork, beef, cheese. But the specialty here is Venetian seafood: the pure, delicate shellfish from the Venice Lagoon. Can we talk dessert? Oro's dolci dazzle. Try the daily chef's desserts. These could be on the menu. Whether they are seated in the dining room or on the patio, diners can choose wines from an elite wine list as well from a rolling trolley with the sommelier's recommendations, like Luce, a delectable Sangiovese-Merlot blend from Tuscany. After-dinner drinks let you linger in the starry Venice night. If you're staying at the hotel, you can slip into slumber in an Oro Restaurant-induced haze. If you're bunking cross the lagoon, you'll start replaying this unforgettable meal on the hotel's private water taxi home. Life doesn't get much better.